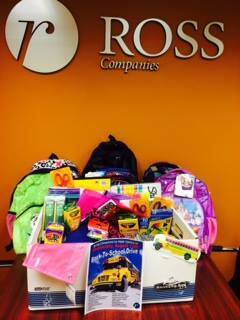 ROSS Companies is honored to give back to the community with our annual Back-To-School Drive. Our corporate office along with all of our communities collected various school supplies such as notebooks, pencils, folders, backpacks and more! ROSS Companies than donated all the supplies collected to local area schools. We are thrilled with the amount of participation from everyone and look forward to another successful drive next year.